Pre-Installation: Saves Clients Time, Money, and Headaches. American Direct >> Uncategorized >> Pre-Installation: Saves Clients Time, Money, and Headaches. American Direct Associate working a pre-installation job in Lancaster, PA.
Pre-installation, one of the many value add services American Direct offers, is the process in which hardware, such as hinges, door closers, exit devices, locks, and electrified hardware, are installed onto the doors prior to shipping to the jobsite. This project for Dudley Street Neighborhood Charter School is a prime pre-installation example. The order of twenty-one doors, with the hardware package by Allegion, was for one of American Direct’s modular build clients. On this job, and all jobs involving pre-installation, American Direct’s team started with the project manager passing along a copy of a hardware installation report and set of floor plans to the installation group. The warehouse foreman set up a hardware area for the installers (similar to a hardware room at a jobsite) making it easy to select the hardware for each opening. 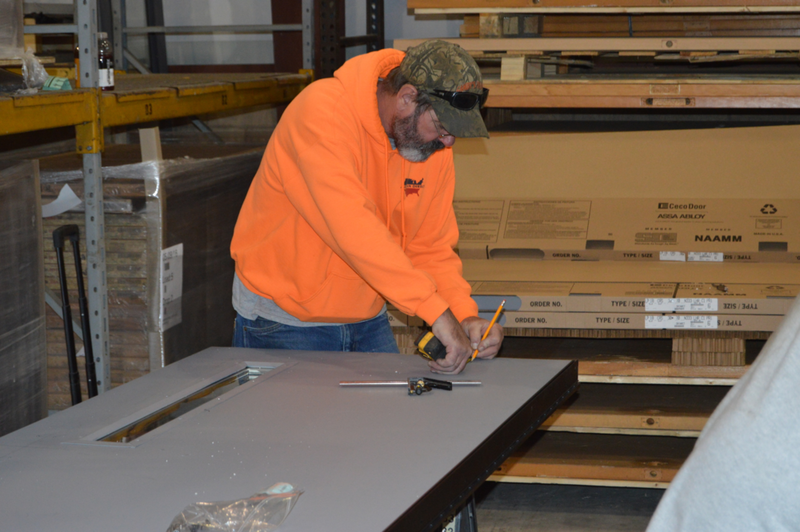 Doors for hardware pre-install were staged in a work area for the installation team to pull from. Each individual door was placed on a set of sawhorses, and hardware for the opening was pulled based on the hardware installation report. The installer applied all surface-applied hardware as the project was sold, as some customers only request the installation of difficult-to-install hardware. The client can rest easy knowing that a door hardware professional installed the hardware. American Direct’s certified carpenters and lockmasters are trained to install Division 8 hardware, as well as Division 10 specialty products, and Division 28 access control products. The installer then reviewed the install against the hardware installation report and signed off upon completion. The door panel was moved from the sawhorse to the skid for shipment. Any loose hardware (i.e. closer arms, screw, strike plates, etc.) was placed in a box marked for the door opening and placed on top of the door. American Direct recycles all cardboard packaging from the hardware, and making for less waste on the job site. Corrugated cardboard spacers were placed between each door on the skid until the skid reached a height of approximately eight doors. For this project, the doors were then shipped to the customer in Lancaster, PA, where American Direct handled the frame and door install into the mobile units. Once complete, the contractor will ship the finished modular units to the site where they will be put together to build the school with the doors already hanging in place. This eliminates hardware issues on site saving the client precious time and money. For more information about American Direct’s pre-installation services contact preinstallation@americandirectco.com.